Да, эта девушка пишет, что не прыгал вчера, на шоу в Жилине, но все равно хореография была красивая. И был в хорошем настроении, улыбался. I admit I'm still worried with his injury. Last night appeared this article from the same site, and they detailed a bit what happened. I don't believe the press 100% for some reasons, but anyway, I don't know what happened to him. In the article they say he cut 3 tendons on top of his hand. The problem is-- if he cut 3 tendons, there is no way he could have moved his fingers and in the close-up video someone filmed on instagram from Kosice he clearly moves all his fingers normally. So he couldn't have cut his tendons as they say. Then I see he has his hand in a fixed cast, even if in Kosice he moved his hand and fingers freely. I don't know what happened to him. A cut finger tendon make you absolutely unable to move and flex your finger. He moves them. What I am worried about is that a cut finger tendon means there is no way to fix it but with surgery which takes a very long time to recover after, and it's very complicated recovery time. That's why I am worried. But as long as he moves the fingers-- the tendons are not cut. Maybe something else happened and the press again understood it all wrong? Can anyone of you girls ask Ari what happened and if Evgeni will need any kind of surgery and then tell us what he said? maybe Ari will answer? I cannot ask Ari because he's not following me on instagram and if I send him a message he won't see it, he has to accept the request, etc., etc.. If he followed me I would have asked him already. All we know is from the press and we all know what press means. The hospital had to come back after the show. 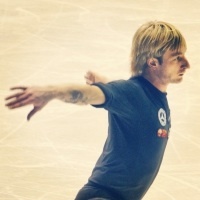 Evgeni Plushenko performed Thursday at the Steel Arena great show. Although two-hour performance was compromised by injury, figure skating fans can finally come into their own. But the sympathetic athlete even at night waiting for the doctors to give him three cut the tendons in the hand treated. Thorough hard time experienced organizer of the show, Mr. Roman ice Hodoň of 212 agencies at the dress rehearsal before the performance at the Steel Arena in fact the biggest star Evgeni Plushenko skated injured hand. "He tried to turn somersaults, but somehow it did not work out skates and hit the arm. I did not see anything, but its like running out of ice, "Hodoň clarify the situation and admitted that at that moment it would be the blood of a hinge. The organizing team immediately drove skater in the traumatology University Hospital. "Whacking a three tendons at the back of the hand. At the hospital, he's busted, they put a splint and obviazali. " According Hodoň Pľučšenko even for a second did not think that would be prominent. While it was possible, given over two hours on ice skaters take turns further and, if necessary, fill the program. If not for his bandaged hand and foreword in Russian before vykorčuľoval ice, no one would have no idea that another half an hour before he was in the hands of doctors. "Absolutely not rattle him it was nice and peaceful. Rather, it frightened all around, "says organizer. "Right after the show we drove him back to the hospital. They did X-rays, and gave Dosil fixed splint. We are very grateful Kosice physicians are excellent approach. " ~Natalia~ wrote: I admit I'm still worried with his injury. Last night appeared this article from the same site, and they detailed a bit what happened. I don't believe the press 100% for some reasons, but anyway, I don't know what happened to him. In the article they say he cut 3 tendons on top of his hand. The problem is-- if he cut 3 tendons, there is no way he could have moved his fingers and in the close-up video someone filmed on instagram from Kosice he clearly moves all his fingers normally. So he couldn't have cut his tendons as they say. Может быть, проблема не с сухожилиями, а с растяжением связок? Тогда операция не нужна, пройдет со временем. Maybe the problem is not with the tendons but with the ligaments (sprain)? In this case the surgery is not necessary. Can anyone of you girls ask Ari what happened and if Evgeni will need any kind of surgery and then tell us what he said? maybe Ari will answer? Maybe Irina will ask later. Не иначе, как сальто дурацкое прыгали, и он на руку упал . Честно, как можно рисковать ради какой-то ерунды? After I found out about his accident, I thought oh god... this is when he injured himself. But my opinion, after seeing the video, is that Evgeni couldn't have injured himself, because he landed it on his legs. I think the guy who fell down right next to him hit him with the skate somehow. It was hard to tell because it was filmed from far away. All I know is that Evgeni didn't fall doing the salto. Irina asked Yana. This is not a serious injury. Irina asked Yana? What did she say, is it true what they said in the press? Yes, as I said, Irina asked Yana. Yana says the injury is not serious, Zhenya performs, everything will be ok. No surgery is needed.